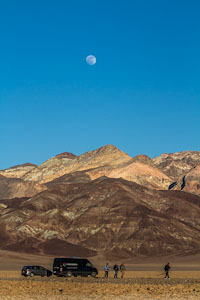 Death Valley National Park is a wasteland of terrible beauty. 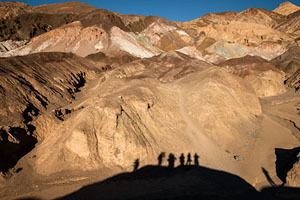 From the extreme heat in the summers on the salt flats, to the extreme cold in the winters on the snow-covered mountains of the Panamint Range, it is a place of geologic contradiction. The formations of rock, sand and mudstone are a wonder to be seen, and the people who lived here in the past and left their settlements standing, are a marvel to behold. This truly is a photographer's paradise. 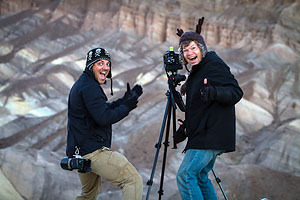 Which is why the Aperture Academy's Scott Donschikowski and Ellie Stone were on hand with vehicle in tow to lead 10 adventurous photographers to seek out and find the iconic imagery this amazing national treasure has to offer. 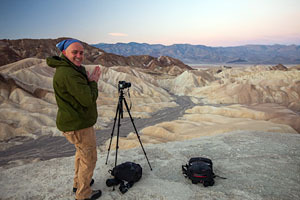 And like any workshop with Aperture Academy, it starts with a round of introductions; this time at the Furnace Creek Ranch under the moonlit sky, warmed by a fire (and a decent bottle of Chardonnay). Ellie and Scott met the group and discussed the itinerary for the next two days of imaging, all while getting to know each participant, finding out how they could assist, and improve any skills each person wished to work on in the upcoming days. Before long, the group retreated to their respective rooms to catch some sleep for the next morning's early rise. A 5:30am meeting time comes early on a photographic workshop, but our group was as prompt as ever and made the loading of the van a breeze. 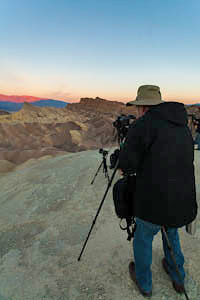 The first stop: Zabriskie Point, a vast open space in Death Valley, set on a short hilly range overlooking the Badwater Basin with Telescope Peak and the rest of the Panamint Range in the distance. Manly Beacon is our focal point there, as its golden hues of mudstone thrust upward from the red and brown colored apron of the wash below. Just before sunrise proper, the hidden sun rays illuminated the sparse clouds above and lit the entire sky a pinkish hue. 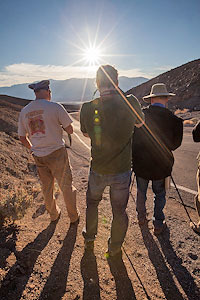 Our group was enthusiastically snapping away as the sun illuminated the Panamint Range all a pink, which sets the golden beacon apart and makes for great contrast with the blue sky above. 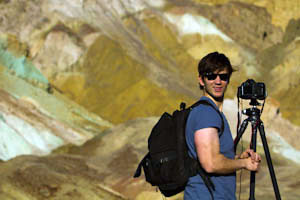 Ellie and Scott instructed the group in the use of graduated filters and proper polarization, as the dynamic range can become a little extreme for cameras to pick up without their use. After a little while longer, the sunrise colors began to fade, and we walked the brief trail back to the ApCab and made our way to the second stop of the day: Mosaic Canyon. 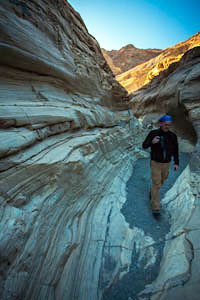 Walking through Mosaic Canyon, the group paused to shoot the beautiful white marble-lined walls that adorn this ancient waterway for the runoff from Tucki Mountain above. The ever constant carving from the water, mixed with the unique geologic makeup of the sediments, make the walls appear to have a mosaic effect, hence the name. 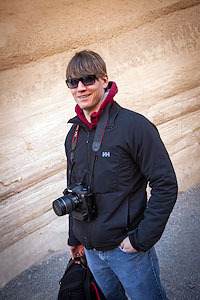 The group retreated about a half mile inward to a large mouth and there we stayed, shooting the marvelous mosaic patterns in the walls of the canyon. All the while, Scott and Ellie made sure to point out interesting compositions and unique perspectives. As the sun began to creep ever higher, we made our downhill trek to the van and to a much-needed break for some food... and perhaps a nap. With early afternoon behind us, the group made its way south to Artist's Drive. The nine mile, one-way road twists and turns its way through the apron of an ancient wash that through the eons has eroded away the top layers of sediment to reveal a plethora of colorful raw oxidized minerals. Of which, the greatest of these is called Artist's Palette. 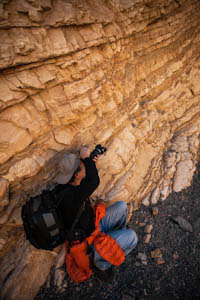 We stopped at two different vantage points for the colored mudstone, to let our photographers explore the many different compositions this unique place has to offer. With the late afternoon sun getting ever lower, we piled back into the ApCab and proceeded to our sunset spot of the famed Badwater Basin. 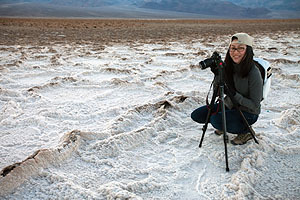 The salt flat here is extremely unique to Death Valley because of the hexagonal shapes that appear after the repeated heating and cooling of the thin salt crust above the basin floor. After a little over a half mile walk through a rocky slough and devil's golf course-like mud formations, we arrived at the Badwater Basin to be greeted by 2-inch high ridges on the salt polygons, and some clouds off in the distance to provide some added color. 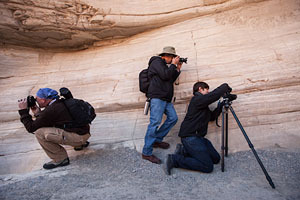 The group enthusiastically spread out and began to search madly for their favorite formation, as Scott and Ellie checked everyone's compositions and provided feedback on camera settings. With the light getting ever more interesting, some of the group began to hop around and try out new comps, both vertical (thanks Ellie) and horizontal. The pinkish and reddish tones of twilight a little after sunset was an awesome addition to this unique landscape. 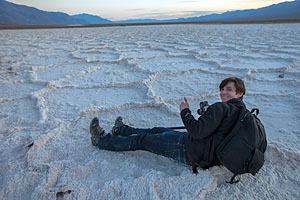 Similarly, the seemingly endless expanse of the heart of the Badwater Basin was a welcome element added to everyone's images. 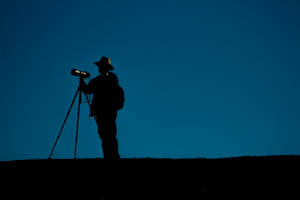 With twilight over, and best light gone, the group began to make the long journey back to the van, aided by the stunning brightness of the near full moon, which was bright enough in the remoteness of the valley to cast everyone a visible shadow. Just a short drive back to Furnace Creek and everyone grabbed their gear and exited the ApCab for a much-needed meal and some rest for the night. That 5:00am wake-up can be hard when you're excited about what day two has to offer! Another 5:30am meet up time was on tap for this final and fun-packed day. 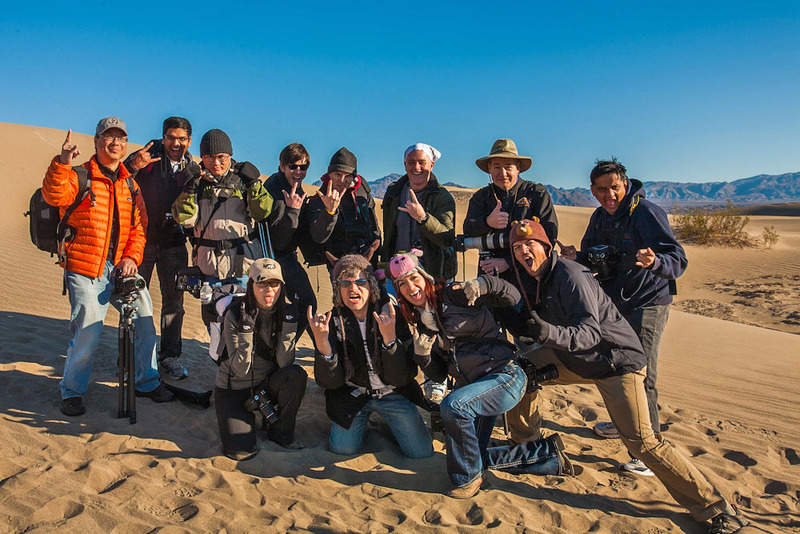 The anticipation of visiting the Mesquite Sand Dunes ensured that the group would once again arrive promptly, for an on time departure. 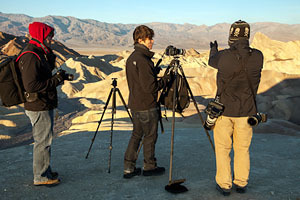 After an easy 30 minute drive, they arrived at yet another of Death Valley's stunning locations. 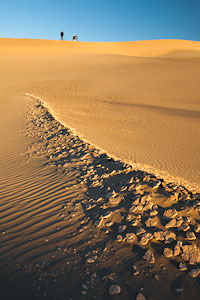 Although the highest dunes only rise about 100 feet, the dunes actually cover a vast area. Flashlights in hand, the group made their way into the dune field. The one-mile walk would be well worth it. 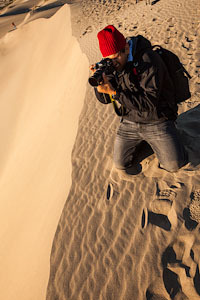 A more secluded area offered the best selection of photographically appealing dunes. Other areas had a lot of footprints from the daily hikers. 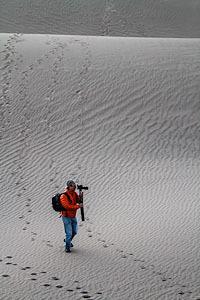 The only footprints this group would see were those left behind by the desert wildlife. They observed some perfect coyote prints, as well as the unique tracks made by the desert lizards. Ellie and Scott walked around with the pupils, to make certain that all were happy with a location and composition. 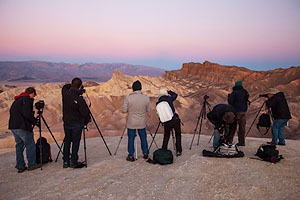 Just before sunrise, everyone had their chosen vantage points, and anxiously awaited the golden light and long shadows. From expansive views to intimate details, the students were giddy with excitement as the landscape came to life with the warm morning light. The instructors walked around to offer up some different composition ideas and discuss some aperture and white balance settings. As the sun reached ever higher, and the shadows diminished, it was time for a much needed morning breakfast break. After a warm meal and some hot coffee, it was time for the group to meet up for the next shooting location. 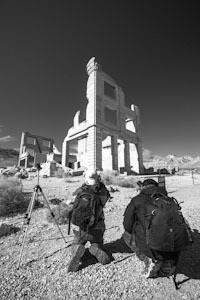 The destination would be Rhyolite, a ghost town, just over the California-Nevada border. Rhyolite was founded in 1904 by those looking for the dream of striking it rich in mining. At one time, up to 10,000 people lived in this small town. However, the financial panic of 1907 took its toll and many left Rhyolite, even dismantling some buildings to reuse, or sell the materials. This had left the town in a state of ruin. 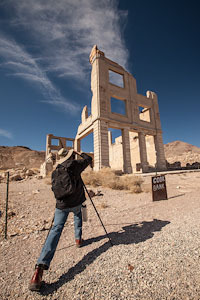 The sharp angles of what was left of the buildings in Rhyolite really lended themselves nicely to the use of wide-angle lenses. 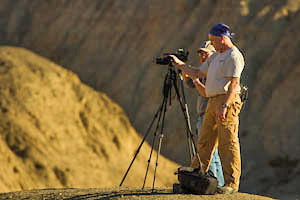 As usual, Scott and Ellie walked around to assist with any questions on capturing the location in its distinctiveness. 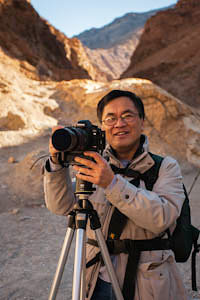 Changing the angle and point of view at which one shoots can sometimes provide just enough variance to yield remarkable images. 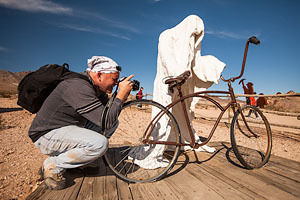 After the group toured the entire town, there was one more quick stop, just down the road... Goldwell and its "ghosts." 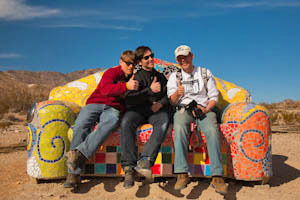 Goldwell exists because artists from afar chose the Mojave Desert as a place to work freely, as opposed to the restrictions in Europe at the time. Their experiences led several of them to create the large scale, on-site sculptures that define Goldwell as a destination. 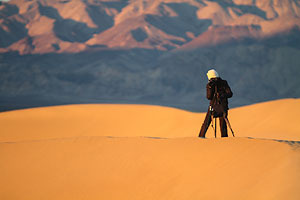 There are few other places where such art-making activities could have taken place; the desert is integral to their work. 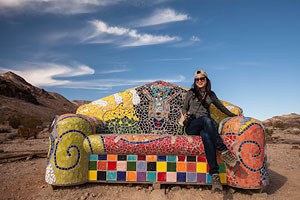 It's strange to see a large mosaic couch out in the desert, but even more strange are the collection of plaster-like, life-size ghosts. The favorite ghost of the group was the single ghost, standing with an old bicycle. After touring the small open-air gallery, it was time for a lunch break, in the nearby town of Beatty. For lunch, some tasty and fresh sandwiches were enjoyed, while Scott and Ellie went over post-processing skills and techniques utilizing Lightroom on their laptops. After brains and bellies were full, it was time to move on to the final location of the weekend — back into the depths of Death Valley. 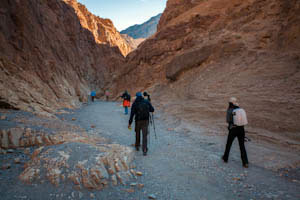 The group headed back and found themselves 200 feet below sea level, at the Badwater Basin. Their final destination was a different and more "off the beaten path" portion of the slat pan. 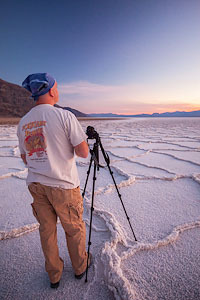 The salt polygon formations again provided a stunning foreground element. All the polygon shapes at this location look remarkable, with their adorned high ridges and twisting cracks. Even though the evening sky was not as spectacular as the previous day's, Scott and Ellie had the students include more of the striking salt formations into their compositions, which provided some spectacular photo opportunities of their own. As the last bit of light faded, it was hard to believe the weekend was coming to a close. 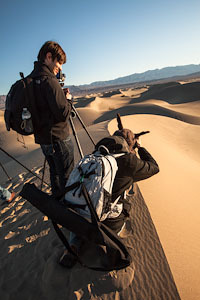 Death Valley National Park has an inhospitable and extreme landscape, but there is no denying that it's a photographer's playground. 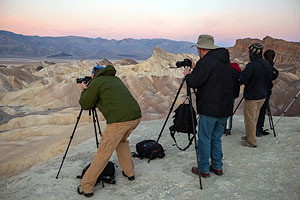 Back at the Ranch at Furnace Creek, the group bid their final farewells and the last winter workshop of 2011/2012 in Death Valley came to a close. 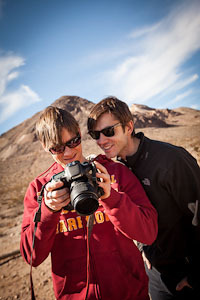 Until next time... Scott, Ellie and the entire Aperture Academy Team!